The “monster” is a 25-centimeter long sea cucumber that lives at a depth of between 300 to 6000 meters. In the deep sea around the Antarctic, researchers have filmed a strange sea cucumber. 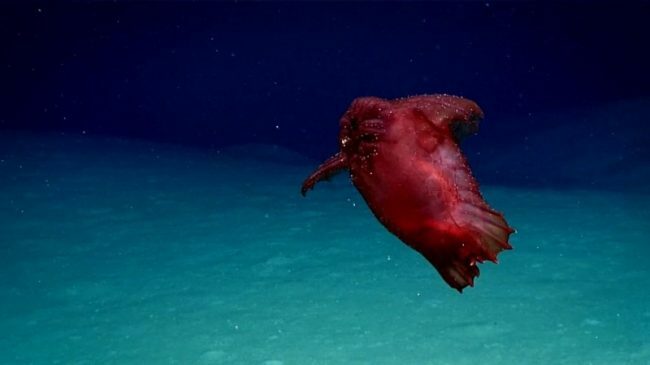 They named the creature “headless chicken monster” which is called Enypiastes Eximia and was previously filmed in the Gulf of Mexico, as the Australian Antarctic Division (AAC) announced. The organization explores the Antarctic and its surroundings for the Australian Ministry of the Environment. The barreled sea cucumber is pale pink to reddish brown in color, depending on the age. It is up to 25 centimeters long and inhabits depths between 300 and 6,000 meters. “The Southern Ocean contains an unbelievable variety of marine organisms, including many commercially desirable species that must be handled with care for future generations,” said Australian Commissioner for Conservation of Antarctic Marine Living Resources (CCAMLR), Gillian Slocum. The data collected with special cameras will be presented at a conference that will be held today in Hobart.